"If only it were all so simple! If only there were evil people somewhere insidiously committing evil deeds and it were necessary only to separate them from the rest of us and destroy them. But the dividing line between good and evil cuts through the heart of every human being, and who is willing to destroy his own heart?" 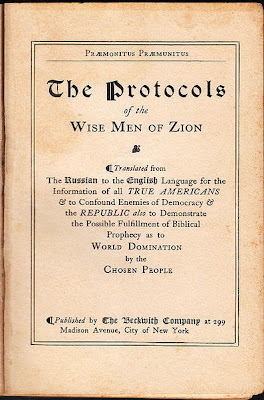 I post the articles below to inform Orthodox Christians of the reality of the distribution of the forged and ridiculous document known as The Protocols of the Elders of Zion in Orthodox circles. This is not only done in Russia which is well known, but also in Greece, Mount Athos, Serbia, certain Orthodox Monasteries in North America and many other places with a majority Orthodox population. Today this document is becoming extremely popular in Islamic countries where the ideology known as "The Narrative" uses it to make up lies against Jews and Americans. Unfortunately it is even referred to by some venerable holy elders and saints of the past and present who accepted it in the simplicity of their hearts and were mislead by its contents, which is not uncommon in the history of the Church or in the lives of the Saints. The Protocols follow a certain paradigm that, although extremist and false, could fit in with an Orthodox eschatology if it were indeed true, although the predictions contained within are extremely vague and existed en masse in other texts of 19th century literature prior to its compilation (hence its forgery based on earlier non-Jewish texts). Since most of our holy elders and saints who accepted this document were not in a position to evaluate its forged nature, I don't think it is proper to blame them for endorsing it, especially when it was introduced to the Orthodox world between the two World Wars and shortly after as news and fact. However, what is lacking is a critical evaluation of this document within Orthodox circles for those who are zealous for the Faith and seek the Truth above all else. It is in this spirit that they accept and endorse The Protocols, and it is in this spirit that they should also reject it when encountered with the Facts which should help enlighten the Truth of our Faith. These Facts should lead to the inevitable conclusion that not only are The Protocols a false document, but the illusion that Zionism is the great enemy of the Church, which is a concept inherited through these Protocols, is also without basis except through one's imagination and speculation. Of course Zionism exists and should be rejected by the Church, but not on the level conspiricists propose by associating it with the imaginary Illuminati. I will not over-extend myself in a long refutation of The Protocols of the Holy Elders of Zion here, but I do want to cite a few articles below to help begin ones research of this document and the ideology behind it. And I would encourage people to be aware of this information so that we can help illuminate our sincere brothers and sisters in Christ who unwittingly undermine Orthodoxy by their endorsement of this forgery. 1. Moscow Times: 'Protocols of Zion' Puts Church in Hot Water - This article reveals the reality of the distribution of The Protocols in Russia and the war against its distribution. More can be read here about the effects of The Protocols in Russian society. 2. The Protocols of the (Learned) Elders of Zion - This is the Wikipedia entry for the document that does an excellent job in a summary format exposing the fraud and forgery behind it. This is an excellent place for one to begin their research. 3. The London Times Exposure - The London Times was the first to totally expose the forgery in 1921. 4. SERMON AGAINST THE POGROMS by Saint Antony Khrapovitsky, Metropolitan of Kiev - The Protocols arose during the time of the pogroms of Russia when Jews became the scapegoat for Russian miseries and Bolshevism. Saint Antony in this sermon (April 20, 1903) tries to illumine his listeners against such a mindset of hatred and enmity against the Jews and he forms here a proper Orthodox attitude towards the Jews. 5. 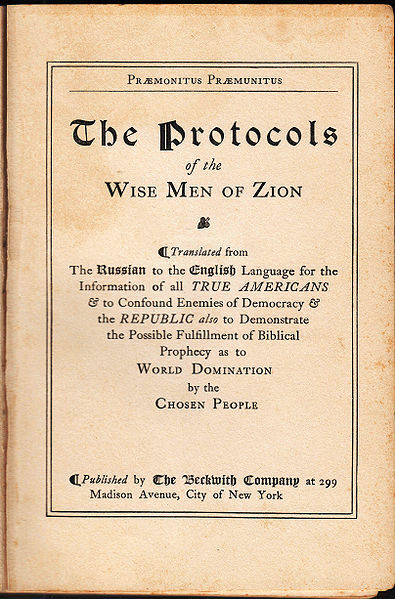 EXPOSÉ OF ... "THE PROTOCOLS OF ZION" - This is a short history of how The Protocols became popular in America to promote anti-Bolshevik bias. 6. Jews Protest The Protocols - This article from the 1920's further shows how popular this forgery was becoming in America and to what extent the Jews went to fight its distribution and endorsement. 7. Sergei Nilus - This is the man responsible for first publishing this forged document in Russia which lead to its distribution throughout Europe by Russian expatriates after the 1917 revolution. Another piece here shows a contemporary Orthodox extremist perspective on this man in relation to The Protocols and how its justification is done based solely on his great veneration for St. Seraphim of Sarov. 8. THE JEWISH QUESTION IN THE RUSSIAN ORTHODOX CHURCH - This piece puts the question in a proper contemporary perspective.